Very few conflict-affected countries have achieved the Millennium Development Goal poverty-reduction targets. You couldn’t get a clearer indication that conflict causes poverty, makes poverty worse, and stands in the way of reducing poverty. 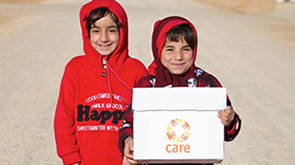 CARE works in many countries currently experiencing or recovering from conflict, where peace is fragile and vulnerable. We provide civilians in war zones with places to go for help, where they can access vital food, shelter and support. We work with communities to ensure they have a say in peace processes, and we work with women to make sure their voices are heard and that they lead efforts to end violence and address its root causes. Women and girls are disproportionately exposed to violence in conflict and post-conflict situations. In addition they are generally excluded from peace-building. Men are usually the causes and drivers of conflict. And they’re not very good at resolving it. CARE supports local actors, particularly women, to build trust within and between communities. And we seek to amplify women’s voices at higher decision-making levels – national, regional and international. We work to make all our projects ‘conflict sensitive’ so that they do not trigger or worsen conflicts. We also focus on preventing sexual and gender-based violence in all our work in conflict and post-conflict settings, and we provide support and counselling to women survivors of sexual and gender-based violence.